Most Of the adjustroents below are Interdependent procedures which MUST be performed in the order presented, however, normal oscillator recalibration WILL NOT require all steps to be performed. therefore, try the SOFTWARE TUNING procedure FIRST and the test equipment procedure only as necessary. The replacement of an IC that has an associated trim potentiometer will require recalibration, except that the replacement of a 3340 oscillator IC may ONLY require SOFTWARE oscillator TUNING – again try the SOFTWARE TUNING FIRST! ◆ Find the out-of-tune oscillator (s ) . ◆ Note the AUTOTUNE parameters and perform minor recalibration where necessary. ● Perform major oscillator recalibration. ● Hit 2, ENTER for the straight brass program #2. 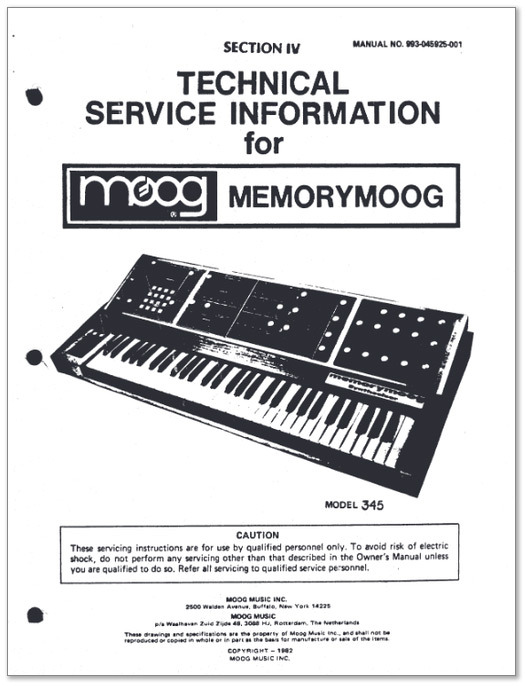 ● Hit KB mode, 1 and ENTER to put the Memorymoog into the “POLY 1” mode (cyclic mode). The display will read “EDIT”. ● Hit C, 5 and ENTER to electrically center the oscillator frequency settings of oscillators 2 and 3 (unison). The display will read “FREQ CTR”. ● Hit C, 4 and ENTER and listen for an out-of-tune voice (rapid beating sound) by repeatedly playing the high C key. The display will initially read “DEFEAT ?” and then will indicate the voice being played, “1”, “2”, etc. WRITE DOWN THE OUT-OF-TUNE VOICE NUMBER! For any out-of-tune voice, isolate and listen to each OSCILLATOR by turning on and off the individual waveform switches (SAWTOOTH) for oscillators 1, 2 , 3. This will locate the out-of-tune oscillator – WRITE DOWN THE OSCILLATOR NUMBER! hit the number of the voice above, which was out-of-tune, BUT DO NOT HIT ENTER!! Wait a second and the display will then query “OSC ?”; hit the number of the oscillator above which was out-of-tune but again, DO NOT HIT ENTER; the display will then flash an expanded scale version of the AUTOTUNE voltages in a hexidecimal (HEX) format indicating from left to right a two digit RANGE, SCALE and HIGH TRIM code. ● WRITE THESE VALUES DOWN with associated voice and oscillator numbers from above. Note that the second digit may “bobble” +/- one digit. An “ideally” tuned oscillator would display 7F 7F 7F. See the accompanying hexidecimal chart. The AUTOTUNE voltages will flash so long as the oscillator is tuned within a +/- 50c range. Howevex, if the oscillator’s tuning is outside this capture range, the display will indicate “DEAD OSC”. The oscillator usually is not dead but simply outside the AUTOTUNE range. See the MAJOR OSCILLATOR RECALIBRATION section of this procedure. If the SCALE and HI are within +/- 2 digits of the RANGE, but the RANGE is too far from the 7F nominal value, ” a simple range adjustment is all that is necessary. * indicates the trim being adjusted in the example. A difference of 1 or 2 between these values means the oscillator is close enough in SCALE and HIGH TRIM but it’s RANGE is too low. Readjustment of the RANGE to the 7F nominal value also brings the SCALE and HIGH TRIM to acceptable values. note: to INCREASE the RANGE readings, turn OSC 1 i 2 RANGE trims COUNTER-CLOCKWISE and OSC 3 RANGE trim CLOCKWISE. Complete readjustment will be necessary if there are differences between the three oscillator values exceeding +/- 2 DIGITS. Below is an example of this condition. *indicates the trim being adjusted in the example. SCALE trim note: To INCREASE the SCALE readings, turn OSC 1 4 3 SCALE trims CLOCKWISE and OSC 2 SALE COUNTER-CLOCKWISE. To INCREASE the “HI” readings, turn, OSC 2 & 3 HI trims CLOCKWISE and OSC 1 HI trim COUNTER-CLOCKWISE. Lastly adjust the RANGE to the nominal value of 7F and the other adjustments will follow automatically. reads “ENTER”; then hit ENTER again and the display will inquire as above for which VOICE and oscillator to display. An ENTER instruction will not be accepted if the flashing display is in an unlite state. To exit this mode of operation, hit ENTER when the display queries “VOICE?”. Oscillators for which the display indicates “DEAD OSC” can be brought into range “by ear” using a tuned oscillator of the same VOICE as a reference source assuming the oscillator is simply out of the AUTOTUNE capture range. 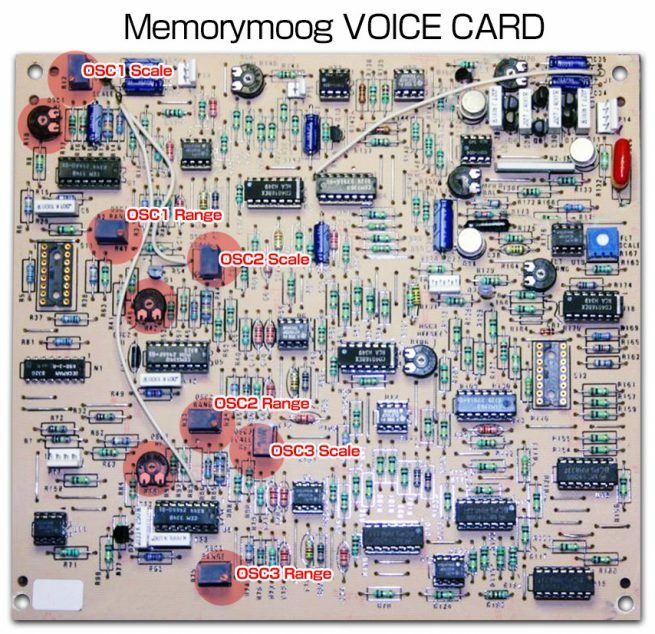 This procedure will be required for a 3340 VCO replacement or for troubleshooting a suspected VCO that is swapped on a VOICE CARD to confirm tuning instability. This allows repeated notes to be played in the cyclic mode (POLY MODE 1) with only the out-of-tune oscillator showing in the ALPHANUMERIC DISPLAY. ● Hit 2, ENTER for the straight brass PROGRAM 12. ● Hit 4 foot OCTAVE for oscillators 1, 2 & 3. ● Hit C, 5, ENTER for a unison sound. ● Hit C, 4, ENTER and repeatedly play the high C key. 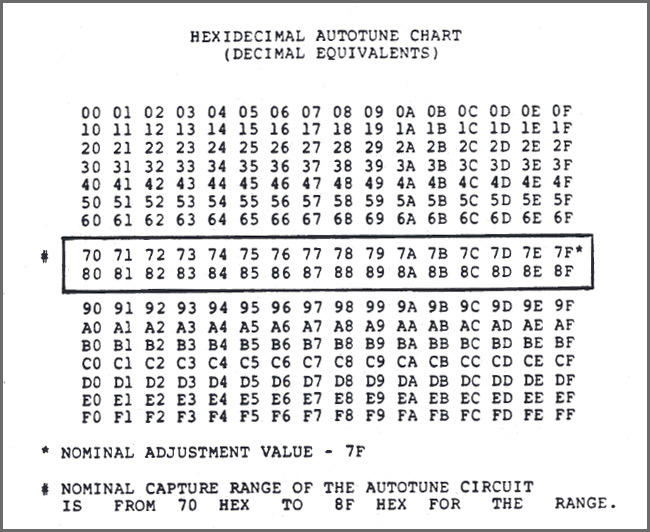 Note that the ALPHANUMERIC display should ONLY show the VOICE to be recalibrated. If not, go back to the defeat routine above. compare the out-of-tune oscillator with ONE of the good oscillators – the second good oscillator should be turned off. ● Hold down the low A (Al) and adjust the associated RANGE trim for unison. ● Hold down the MIDDLE (third) A (A3) and initially adjust the associated SCALE trim for “unison” but note the number of turns needed for unison (example: three turns clockwise). The SCALE trim significantly interacts with the RANGE trim, therefore, “overshoot” this SCALE trim by twice the number of turns (example: additional turns clockwise). Repeat the six RANGE and SCALE adjustments until both the low, and middle A notes will zero beat. ● Hold the High A (A5) and adjust the associated HI trim for zero beats. oscillator will not autotune. When this tuning procedure is completed, hit C4 , ENTER, ENTER to ENABLE all six voices. The display will then indicate “ENABLE”. Perform POWER SUPPLY, DMUX and PRELIMINARY OSCILLATOR TUNING (Steps I, II and III); omit the next four steps – preliminary CONTOUR/GLIDE, preliminary COMMON ANALOG, FILTER tuning and VCA balance (Steps IV, V, VI and VII) -unless an associated part has been replaced; proceed with MAIN OSCILLATOR TUNING (Step VIII), SCALING adjustments (Step IX) OCTAVE TRANSPOSE (Step X). abbreviated oscillator tuning only Steps I, II, III, VIII, IX and X. The remaining adjustments, such as MODULATION OSCILLATOR (Step XI), PITCH WHEEL Offset (Step XII), VOICE MODULATION Offset (Step XIII) and FOOT PEDAL adjustments (Step XIV) can all be skipped unless associated parts have been replaced. NOTE: When performing MAIN OSCILLATOR tuning Step VIII be aware that the SCALE trim SIGNIFICANTLY offsets the RANGE trim. To expedite tuning time, “over-shooting” the SCALE trim by factor of two in the opposite direction speeds tuning, eg. if the SCALE is 10c flat, turn the SCALE adjustment approximately 20c sharp. Turn power on and allow unit to warm up at least ten minutes before attempting calibration. Use of a 4-1/2 digit DVM is NECESSARY for accurate calibration. 1. Attach the negative DVM probe to the negative side of C74 and the positive probe to the negative side of C75, both on the DMUX board.